Day trip charter service from Seattle directly to Butchart Gardens! Less than 90 minutes from Seattle. 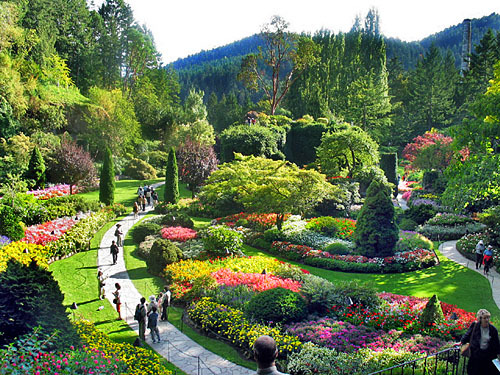 Butchart Gardens is one of Victoria’s most popular attractions and is registered as a National Historic Site of Canada. Enjoy a beautiful flight from Seattle up the Puget Sound and along the San Juan Islands enroute to Sidney BC for a Canada Customs clearance. Shortly after the customs stop your charter flight will depart to the shores of Butchart Gardens. Our charter tour option includes 2 hours of layover for the aircraft while you enjoy your tour of the gardens. Once your Butchart Garden tour has concluded we will fly you directly back to Seattle which is a one hour flight. For reservations and information for our Butchart Garden Tour flights, please call or inquire about a flight via our website. Our Dehavilland Beaver DHC-2 seaplanes seat up to six passengers (depending on passenger size and weight) and 10 passengers on our Dehavilland Turbine Otter. Chartering the aircraft allows you to leave on your schedule. With our fleet of four aircraft we can accommodate groups of 28 passengers. Charter Rates – Rates are based on flights from our base in Renton to fly to Butchart Gardens, layover for two hours and return to Seattle.